Active cooling solution with heatpipes for COM Express basic B7XD module. All standoffs are M2.5mm thread. Heatspreader with vapor chamber for COM Express basic B7XD module. All standoffs are M2.5mm thread. BeagleCore™ BCM1.ETR offers the core features of the popular BeagleBone Black on a stamp-sized soldering module and is suitable for extended temperature range from -40°C to +85°C. 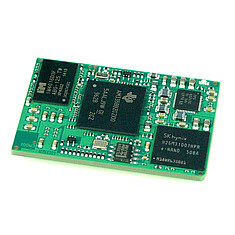 BeagleCore™ BCM1 offers the core features of the popular BeagleBone Black on a stamp-sized soldering module. 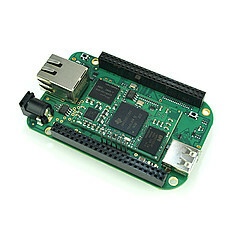 BeagleCore™ BCS1 is an evaluation board compatible with BeagleBone Black and includes the BeagleCore BCM1 module. 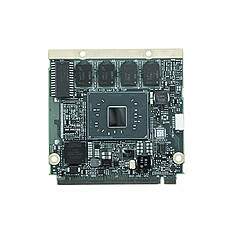 Evaluation Carrier Board for COM Express type 10 modules with interfaces for PCI Express, SATA, USB 2.0, LVDS, DisplayPortI, Gigabit Ethernet and many more. Intel® Atom™ QuadCore processor on COM Express Typ 10 mini with 4 x 1.91 GHz and Intel® HD Graphics Gen 7, 4GB 1333MT/s DDR3L onboard memory as well as 16GB eMMC onboard Flash. Standard heat spreader for COMe-bSL6 Express modules. Standard heat spreader for COMe-cSL6 Express modules. Standard heat spreader for COMe-mBTi10 Express mini modules. Standard heat spreader for COMe-mBTi10 Express mini module. Support package consisting of 2 hours for personal support by one of our iesy experts. Support package consisting of 4 hours for personal support by one of our iesy experts. Support package consisting of 8 hours for personal support by one of our iesy experts. Intel® Atom™ "Apollo Lake" DualCore Prozessor auf COM Express Typ 10 mini mit bis zu 2 x 1,80 GHz (Burst) und 2GB 1600MT/s DDR3L onboard memory sowie 16GB eMMC onboard flash. Standard heatspreader for COM Express mini MA5 module. All standoffs are M2.5mm thread. 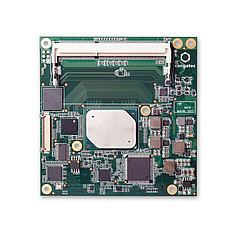 Qseven module with Intel® Atom™ E3815 single core processor with 1.46GHz, 512kB L2 cache, 1GB 1066MT/s DDR3L onboard memory. No onboard eMMC. 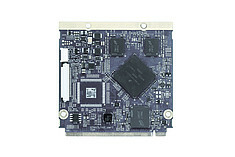 Qseven module with Intel® Atom™ E3845 quad core processor and 1.91GHz, 2MB L2 cache, 4GB 1333MT/s DDR3L onboard memory. No onboard eMMC. Qseven module with Intel® Atom™ E3845 quad core processor and 1.91GHz, 2MB L2 cache, 8GB 1333MT/s DDR3L onboard memory and 16GB eMMC onboard flash. Standard heatspreader for Qseven modules conga-QA3 and QA3E. All standoffs are M2.5mm thread. Qseven module with Intel® Atom™ E3815 single core processor and 1.46GHz, 512kB L2 cache, 2GB 1066MT/s DDR3L onboard memory and 4GB eMMC onboard flash. Industrial grade temperature range from -40°C to 85°C. Standard heatspreader for Qseven module conga-QA4. All standoffs are M2.5mm thread. Passive cooling solution for Qseven module conga-QA5. All standoffs are M2.5mm thread. Standard heatspreader for Qseven module conga-QA5. All standoffs are M2.5mm thread. Standard heatspreader for Qseven module conga-QG. All standoffs are M2.5mm thread. Qseven module with ultra low-power NXP ARM® Cortex™ A9 single core 1GHz processor and 512kB L2 cache, 1GB onboard DDR3L memory and 4GB onboard eMMC. Commercial temperature range. Standard heatspreader for SMARC module conga-SA5. All standoffs are M2.5mm thread. SMARC 2.0 module with Intel® Atom™ x5-E3940 quad core processor with up to 1.8GHz (burst), 2MB L2 cache, 4GB 2133MT/s LPDDR4 onboard memory and 16GB eMMC onboard flash. Industrial grade temperature range from -40°C to 85°C. SMARC 2.0 module based on NXP i.MX 7 Family with up to 2 x 1 GHz Cortex® A7 + 200 MHz M4 processor, up to 2 GByte RAM, dual channel LDS interface and up to 2 x GByte Ethernet, 3 x PCIe and 4 x USB 2.0. Passive cooling solution for COM Express compact TC170 module. All standoffs are M2.5mm thread. Standard heatspreader for COM Express compact TC170 module. All standoffs are M2.5mm thread. Standard heatspreader for COM Express compact TCA5 module. All standoffs are M2.5mm thread. Passive cooling solution with heatpipes for COM Express basic TS170 module. All standoffs are M2.5mm thread. Heatspreader with heatpipes for COM Express basic TS170 module. All standoffs are M2.5mm thread. Evaluation Carrier Board for COM Express Type 7 modules withup to four 10GbE SFP+ fiber/copper ports implemented via Intel Cortina 10GbE Phy's. The carrier features an Aspeed AST2500 Board Management Controller (BMC).